You already know all about about UDP area reps, Elvin Penner from Cayo Northeast, and Edmund "Clear the Land" Castro from Belize Rural North, who are under public pressure. Well, tonight, the UDP's Corozal Bay Area Rep. Pablo Marin is the one who has questions to answer. Corozal resident Lennox Garbutt Sr., claims that Marin used his influence as an Area Representative and a Cabinet Minister to have Garbutt's lease to a piece of land cancelled and then transferred to Marin's sister, Ada Luz Romero. "I was isssued this parcel of land on November 30th 2011. All through I paid my annual tax which is $60 per year and finished paid $120 on the 13th September 2013." Daniel Ortiz reporting He thought that he was secured for the time being. He later discovered that he wasn't the only one with lease to the land. "When I went to the Lands Department one of the officer told me that they have someone with another lease. I made several trips to Belmopan to investigate. When I reach there I went to the Commissioner of Lands Mr. Vallejos and asked him. He told me that nothing like that can happen. He assured me that he personally would get the purchase price the land. He was the one that told me to pay up the tax, so that I could get my purchase price." "I went back to Corozal and I leave it like that for about 2 weeks. I went back to Belmopan after I paid the tax to get my purchase price for my 20 acres. When found out that the land issued was recommended to cancel by Hon. Pablo Marin." 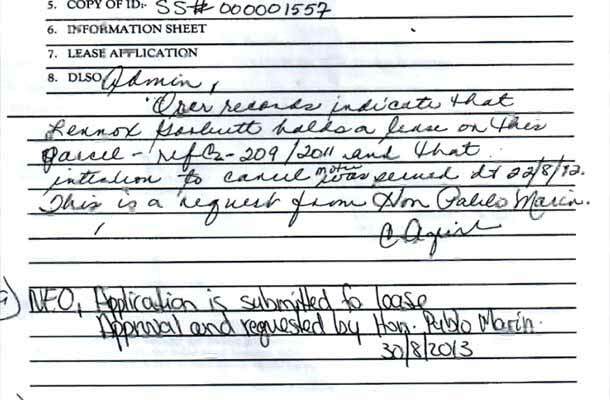 Seen here, the document, it says that Ada Luz Romero, the sister of Pablo Marin, the Corozal Bay Representative, received lease to the land. "I found out that it was issued to his sister Mrs. Ada Luz Romero and that made me more upset, so I went back to the Commissioner and told him that this land has another owner and he said no. When I pull out the files and show him, he told me that there must be an error." "I went over to the PM's Office, but at that time he was out of the country, so I spoke to his secretary. His secretary tried to get the Deputy PM Secretary so that I could get an appointment. That went on for 3 weeks." And so, Garbutt decided to come to the media because he doesn't agree with what has happened and he's being pushed around. "They also told me that the land was cancelled because of non-development. I got the land on November 30th, 2011 and it was cancelled on August 22nd, 2012 - none months after. I also paid a private bulldozer to push a road to this land because there was no access to this land. This land was in high bush. I paid out of my pocket my money to open a road, so that I could have access to this land. I also developed a small piece of the land to put pig pens and other stuff on it. But due to I ran out of money then I just left it as that. But now I found out that someone has the same lease - that's not right." And he thinks that he's been wronged because he spent a total of $12,000 in an effort to develop the land. He says that the bulldozer provided the only road to the area, and that should count toward development. The fact that Pablo Marin recommended that the land be given to his sister only adds insult to injury. "I contacted Minister Pablo Marin one evening and ask if I could have a word with him and he said sure. I told him that I heard that he recommended to cancel my land. He told me that he would never do such thing. When I pull out the files with his sister name on it, then he said that he already done that. That's what he told me and that got me more upset." "I invested a lot of money in the land, so surely I want back my land and the next step I am going to take from here is to try to make an appointment to see the Prime Minister and if within a week or two I don't get any kind of feedback from his office then I will seek legal advice. I won't go ahead to seek an attorney because I was registered in the PM's area before I moved to Corozal. I will try to speak to him first and after that if they don't come to a solution then I will seek legal advice." Today, we contacted Pablo Marin, and he told us that Garbutt's allegation is completely misconceived. According to Marin, the recommendation to cancel the lease granted to Garbutt was made by Hugo Patt, the Corozal North Representative, whose constituency the piece of land sit in. Marin said that his sister, Ada Luz Romero, is about to retire and she approached Hugo Patt for a piece of land to start a farm. He added that he did indeed make a recommendation to Patt on her behalf, and she was given the lease. Marin told us finally that Garbutt only has himself to blame for why he lost the land because he was issued with an intent to cancel the lease due to non-development, and he didn't comply, and neither did he go back to the Lands Department to present his case as to why that was. Lennox Garbutt, a resident of Corozal North Constituency says he is a victim of political land fraud and nepotism. Garbutt who once held a lease for a twenty acre parcel in the Consejo Area in Corozal, found out a few months ago that parcel 73- the parcel in question- has been re-issued to another Corozal resident by the name of Ada Luz Romero. According to Garbutt, Romero is the sister of Minister of Health and Corozal Bay Area Representative Pablo Marin who was the one who recommended for the parcel to be reissued. We got in contact with Commissioner of Lands, Wilbert Vallejos who clarified several information as it pertains to Garbutt’s claim. Vallejos says that at no time he told Garbutt that parcel 73 was reissued because it was an error. Additionally, Vallejos told us that the two miles of road that Garbutt created leading up to the land is not considered as development because it was done outside the boundaries of parcel 73. Vallejos says that he doesn’t know if the land which was reissued to Pablo Marin’s sister is a coincidence or not but says it was given to a more deserving person.